Create a site folder with an empty static directory. The list of total files generated does not display. Files generate and build into the default destination directory as expected. This was the behavior previously observed with my test case in 0.53.0, and the behavior observed when the empty "static" directory is deleted or a file is added to it (with the addition of that blank file being notated in the list of generated files). This also affects hugo server; namely, preventing it from running entirely. In order to get hugo server to run, either the empty "static" directory needs to be deleted or a file needs to be added to it. Interesting. I can't reproduce it neither on 0.54 nor on HEAD commit of the repo. Can you create a repo with the site that's failing to build? Nothing significant has changed in my environment in the past few days, but I now seem to be unable to replicate this, even though I could make this trigger over and over and over just a few days ago. I'll re-open if I see it again and can provide any more information on what particular circumstances make it happen. Appears (to me) to be an empty folder inside of static. This looks like a bug to me. Readdir in Golang returns io.EOF when a directory is empty, which I suspect is what happens here -- and it shouldn't fail. I'm using https://github.com/bep/hugotest as a test hugo site. It builds without any issues, no matter if I add an empty folder or not to static. @themartorana, can you provide a test site that reproduces this issue? If I renamed the /static/css folder to /static/empty-test the error went away. 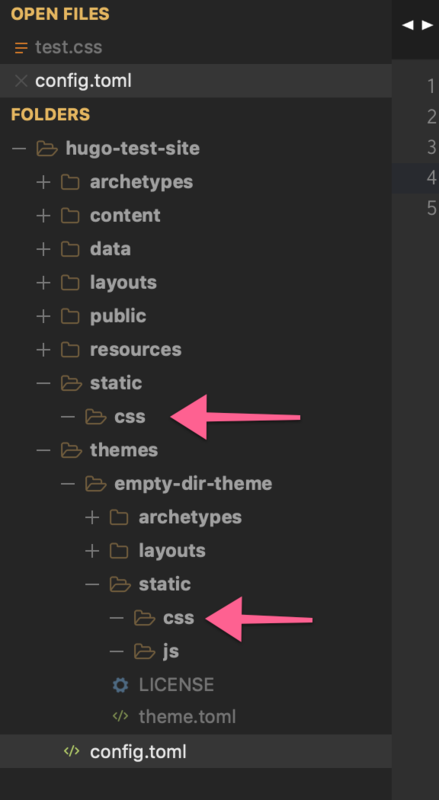 But if I added a matching folder /themes/empty-dir-theme/static/empty-test the error came back.